There are but few ‘once upon a time’ moments in life where friends, family, and colleagues can pause amid the flurry of busy calendars and far-flung lives to stop time and celebrate special moments and events. Such was the case for one special evening to honor and to commemorate the coming of age, turning 15 with a Quinceañera, special celebration that would make entrance into adulthood for two very special cousins. 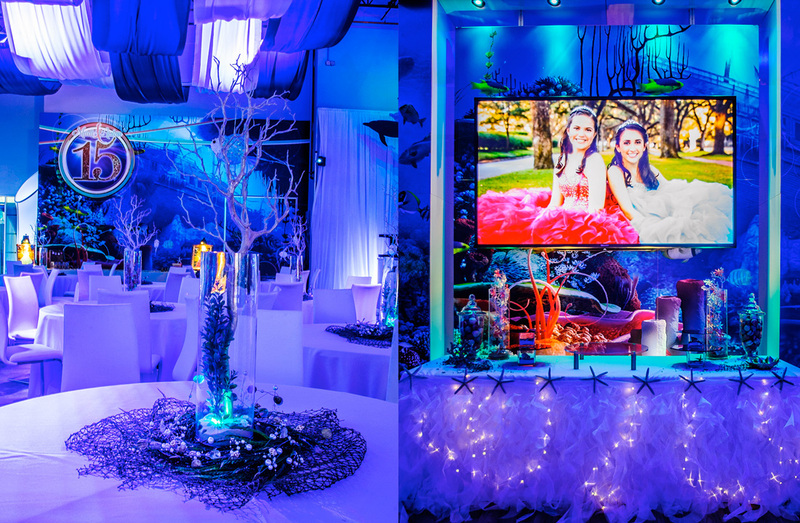 Sharing their dreams and visions with 2020 Exhibits Global Events production and design team, together with their family, the girls hoped their special event would be an experience unlike any other. 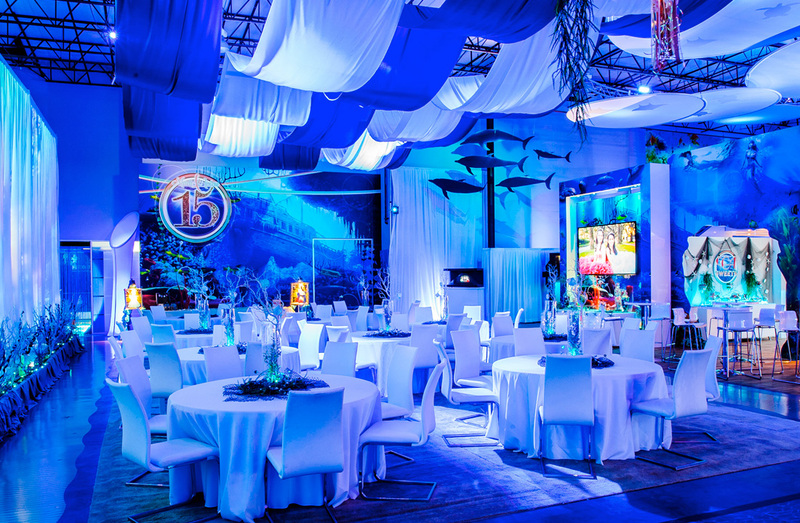 Envisioning the underwater feel of the ocean -- with a twist -- the overarching goal was to experience Under the Sea with an epic party and celebration. “There is no magic in magic, it’s all in the details,” wrote Walt Disney. 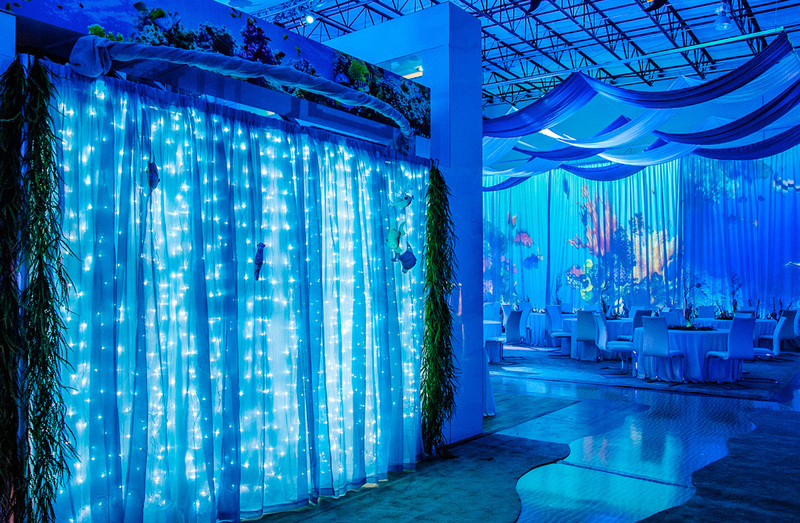 But based on the stunning results of 2020 Exhibits ‘Under the Sea”-themed private event, in details, there are both magic and memories to last a lifetime. 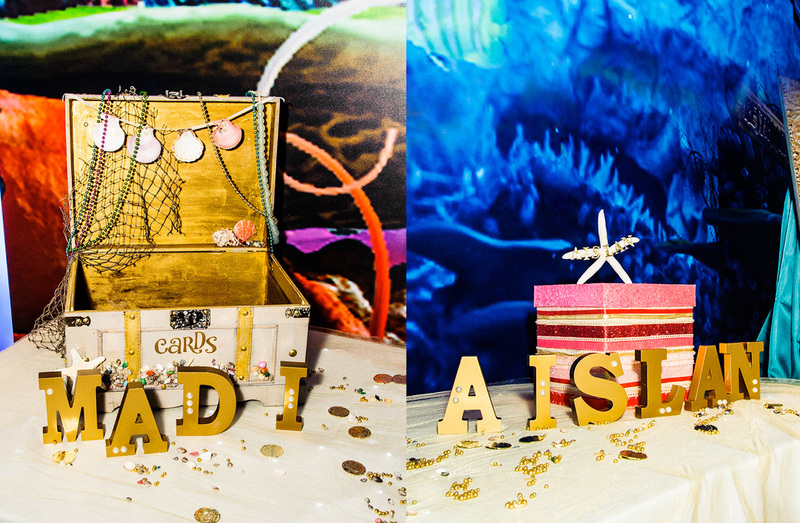 With this bold aesthetic and visions of an “Under the Sea’ theme, the team dove in to start planning for this highly visual and engaging event. 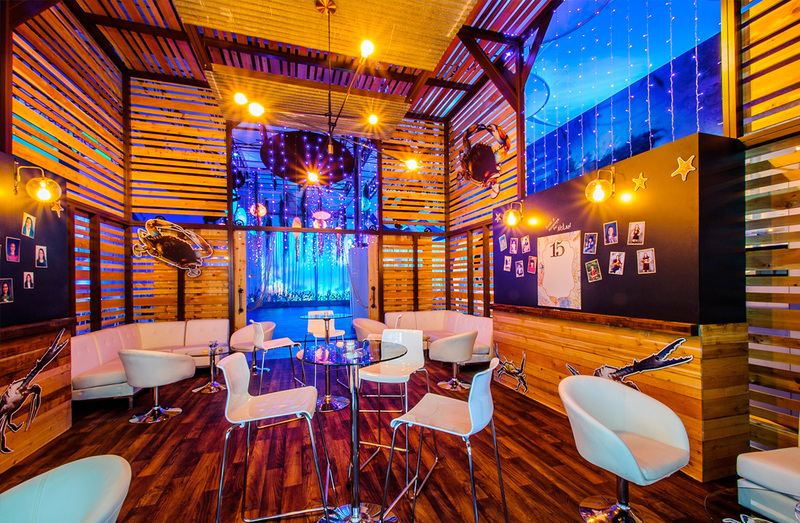 Transforming their large, industrial showroom into an inspired and inspiring party space, with the perfect blend of dramatic decor, personal touchpoints, and unforgettable epic moments was the driving mission for the 2020 Exhibits Global Events Team. 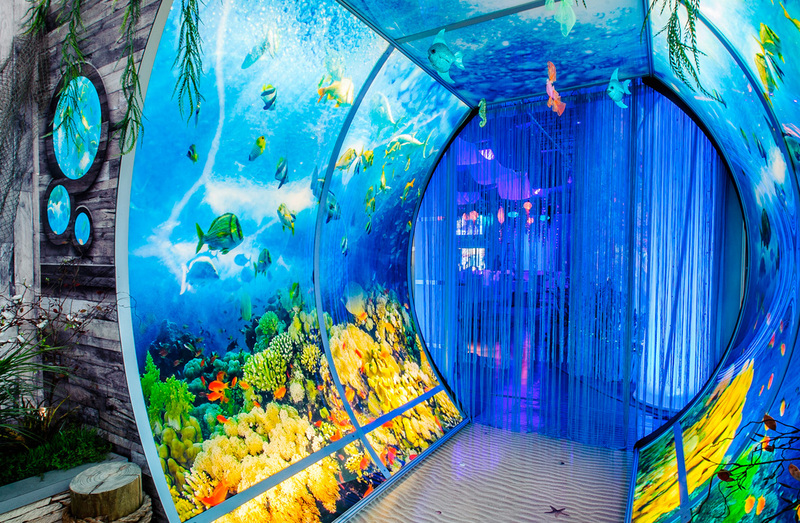 From the minute guests walked through the door, it felt as though they were entering an underwater paradise. 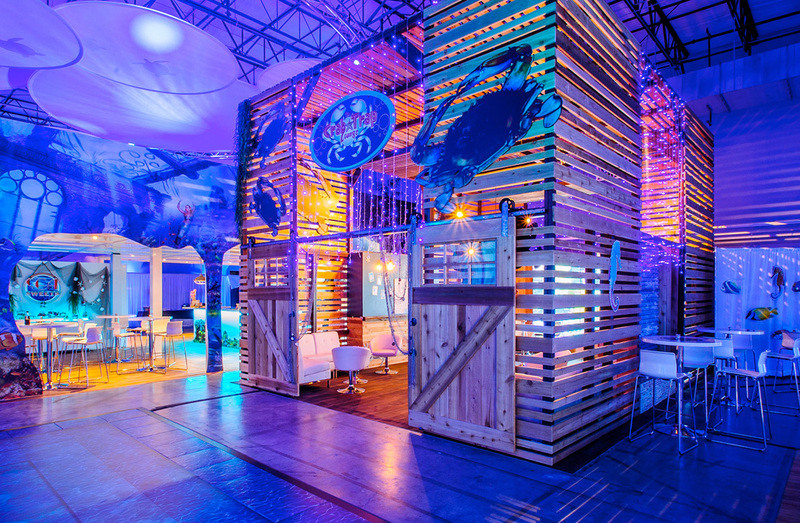 The team created an eye-catching entry, inviting guests to step into the story on a wooden boardwalk, where they could see the sand underfoot as they were immersed in an ocean reef, walking through an aquarium-like entry portal to the party space. 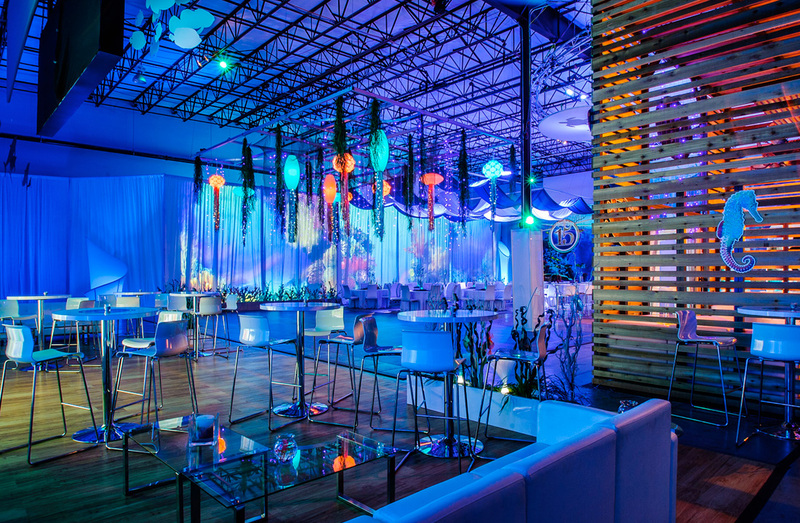 Visions of sky-high waves of draping awash in vibrant shades of soft blue lighting, added a cool look and feel within the party space. Pausing just long enough to breathe it all in, guests moved further into this ocean paradise walking alongside swaths of curtains projecting video scenes from the sea. 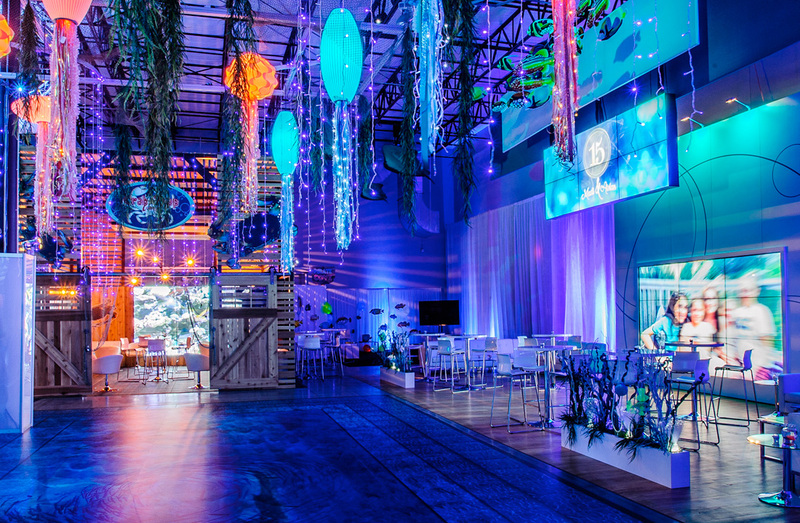 From the rich jeweled tones of the deep blue sea to bright sparkling lights, the artistry and craftsmanship of the 2020 Exhibits Global Events Team this raw, industrial space at every turn. 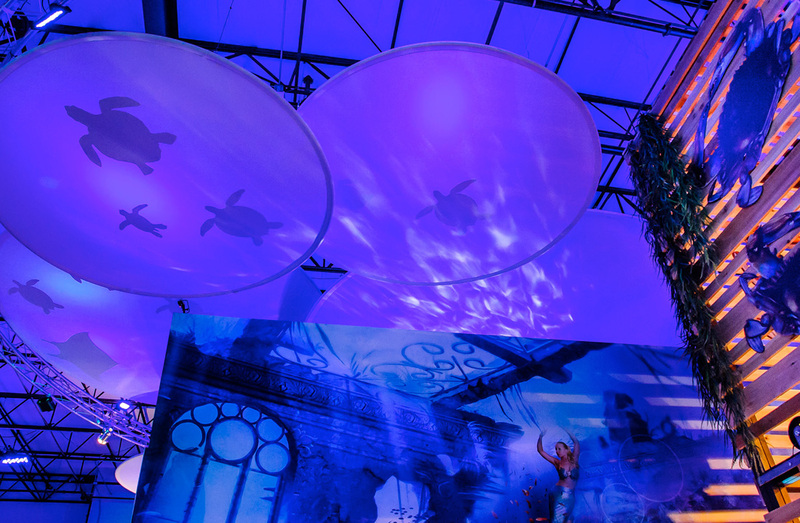 Bringing it all together with a fluid, cohesive 'Under the Sea' theme and experience the team created, designed and built all the elements for this over-the-top special event. 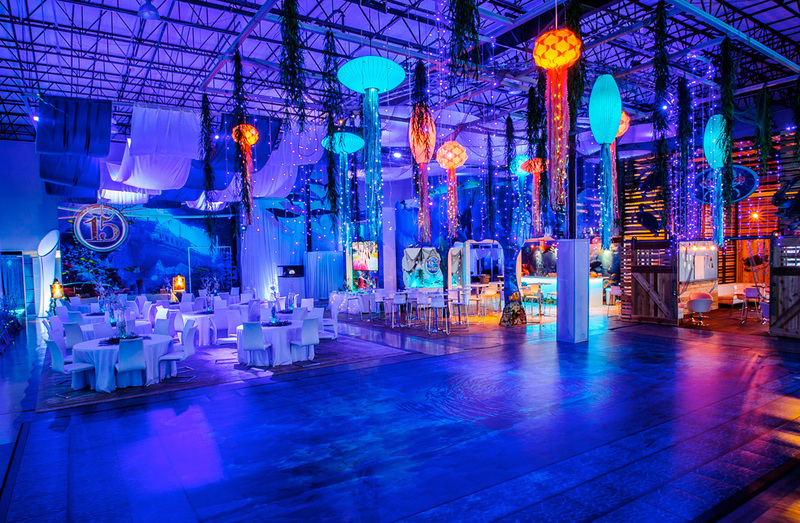 Finding creative ways to generate excitement and engagement, twinkling on high were custom-designed light structures that resemble lush coral and creatures of the sea were featured above a raised ocean floor, inspiring guests to dance the night away. 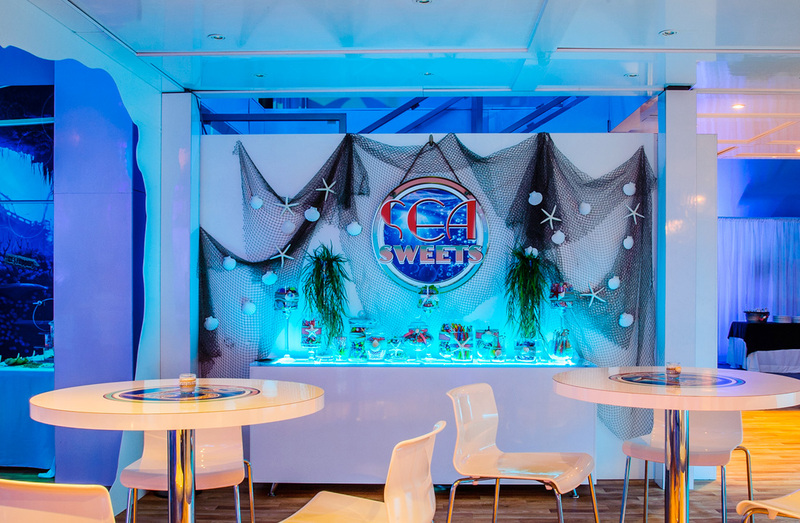 Decor reflected the Under the Sea chic theme with crisp table linens, netting, sand, seashells, and sparkling glass vases that served as centerpieces. 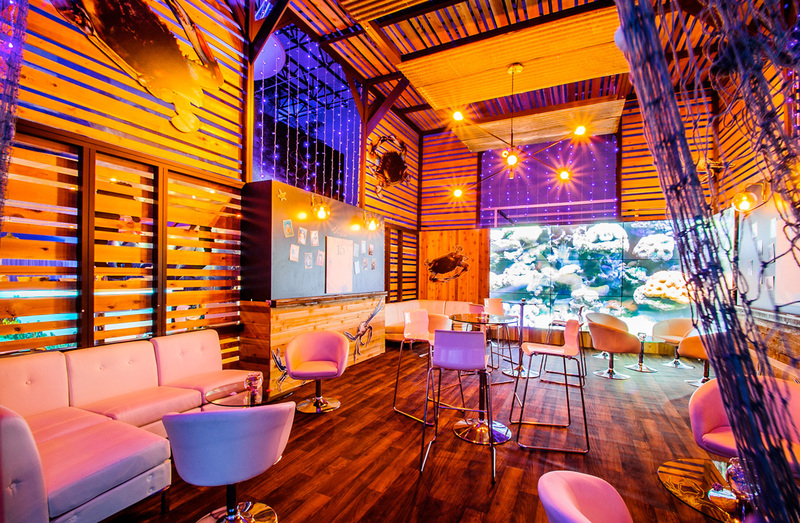 For those needing a break from the dance floor, the ‘Crab Shack’ offered a refreshing respite, with a mod, cozy lounge area, charging stations, a massive video wall streaming ocean scenes and, a step back in time, with old-school chalkboards to write special messages for each girl. 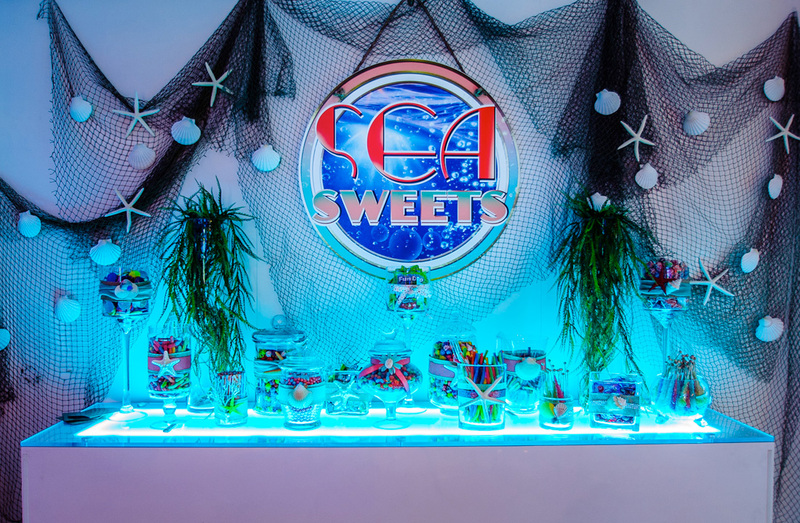 The Sea Sweets candy extravaganza played off the theme with a sparkling ribbons, seashells, and a dazzling array of colorful, sweet treats. 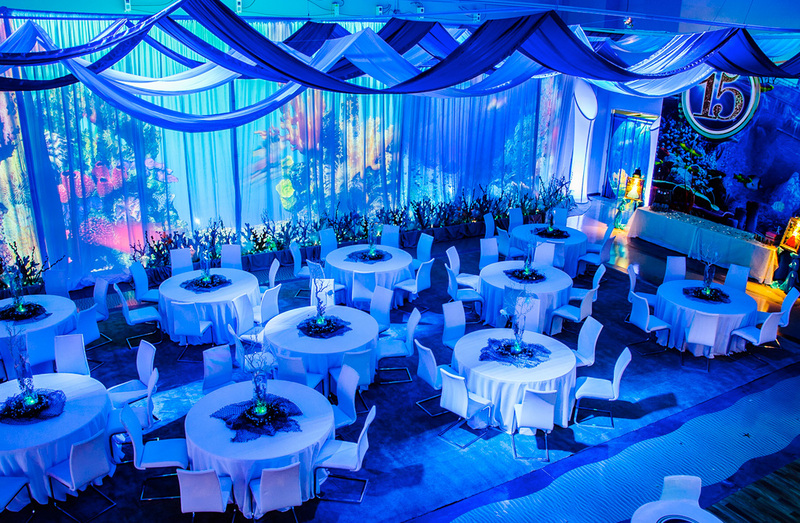 Once upon a time, if you can dream it, the 2020 Exhibits Global Events Team can create an event like no other that has genius, power, and magic in it, creating memories and experiences to last a lifetime.